I’m an amateur Fermentation Freak. A cultured food fanatic. I am the proud owner of millions of microscopic pets. Nothing puts a smile on my face quite like when my little dudes create new, exciting, delicious (and exponentially healthier) foodstuffs from the very basic ingredients I feed them! One of the best things about our future business plans (other than that we get to make and drink whisky, be our own bosses and live in one of the most stunning places in the world), is that this hobby of mine will form an important part of our business! To make our whisky, we’ll make a sugary solution called a wort, by mashing, sparging and filtering locally sourced malted barley. This wort will be pumped into our fermentation tanks and the magic will happen when we add our chosen team of yeasts and bacteria. While everyone knows that fermentation produces alcohol, its lesser appreciated but arguably far more important role is to produce all the chemical compounds that determine the smell and taste of a spirit. Fermentation is what sets you up for the rest of the whisky-making process; you can’t distil or age a tasty product if you don’t have tasty stuff in there to begin with. Becoming great at fermentation is absolutely fundamental to the success of our endeavour. But while we can use the best ingredients possible and provide the best conditions possible, the results of any fermentation are ultimately up to the millions of little dudes. We will never be completely in control of the process because we’re not the ones who’ll be doing the work! Instead we need to convince the little dudes to be on our side. We need to make sure they’re happy, getting along nicely with the rest of their community and doing the jobs we need them to do for us. They’re even allowed, even encouraged, to get a bit creative as long as they don’t produce anything too unsavoury. Simon the Sourdough Culture has been with me since March. Wild sourdough cultures and I go wayyy back and he’s been just as loyal as the others- no matter how many baker’s rules I break, he’s yet to have produced something that still didn’t taste great when I took it out of the oven. He’s the reason why my Mum calls me ‘The Yeast Whisperer’ and that’s a skill I hope to keep!! Yogi-Bear Yogurt came about after a necessary experiment- trying to turn horrible watery Chilean yogurt into the thick and creamy stuff we enjoy in Australia. From everything I’ve read it is possible to make yogurt from store-bought yogurt once, maybe two times, but impossible after that. Yogi has defied all the naysayers and has made weekly pots of yogurt since March, even surviving a forced hibernation in a friend’s freezer for 2 months while we were in Peru! 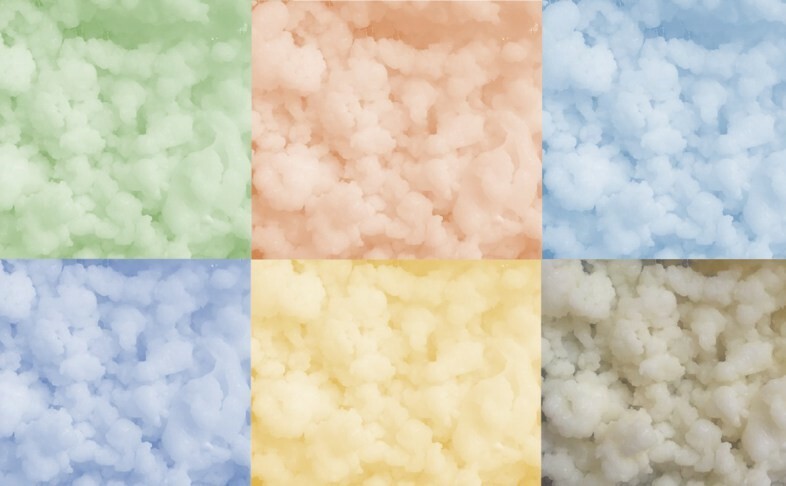 The Kevins (pictured at the top) are my recently homed milk keffir grains and they’ve probably been the easiest guys I’ve ever looked after… but what they make is honestly the hardest product to use. Milk keffir tastes somewhere between cheese, yogurt and champagne. It’s a taste that’s certainly acquirable but it’s not exactly something you can easily add to most meals. I can make a mean pro-biotic lemon pudding though- hit me up if you too are struggling with excess milk keffir and I’ll happily share my secret recipe! Scooby-doo was a result of a culture swap I did with a lady I found on Facebook. Scooby-doo looks like a jelly-fish that lives in a jar of sweet tea on our top shelf. 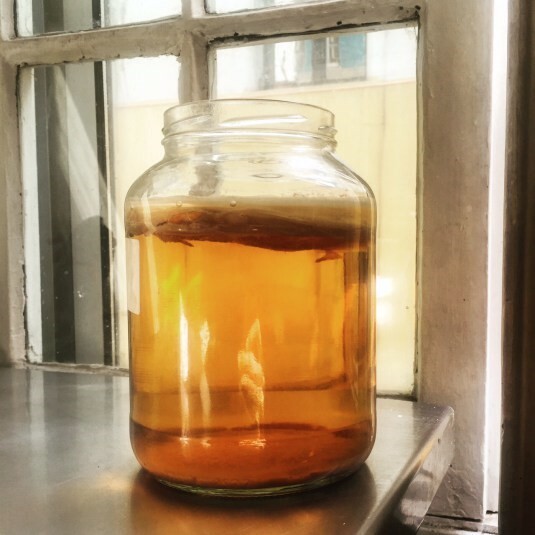 He is actually a SCOBY (Symbiotic Community of Bacteria and Yeast) and produces gorgeous fizzy Kombucha every two weeks. I’ve had such success with these cultures lately that I have to be getting better at this! While I sourdoughed a fair bit back in Aus, my overall fermentation success rate was only about 50%. I once had such a spectacular falling out with an attempted Cauliflower pickle (smelliest thing in my whole entire life) that I damaged my Culture Cultivating Confidence significantly. I also never got my ginger-beer plant to get moving, despite repeated attempts and a precious handed-down family recipe from a family friend. Fermentation will certainly be an important challenge for us and no-doubt something that’ll take a bit of practice. On the other hand, maybe I really have learnt to be a ‘Yeast-Whisperer’ and this fundamental step will be our easiest!